Access Slots: Openings in Drum Brake Backing Plates or Drums to allow access for brake adjustment. Accumulator: A chamber in the Hydraulic Power-Assist Unit. Ackerman Principle: The steering geometry where the ends of the Steering Arms are angled to cause the inside steer tire to turn more than the outside steer tire when a vehicle is making a turn. Adjuster: A device used to adjust clearance between Brake Linings and the Drum or Rotor. Adjusting Cams: Eccentric devices used to make adjustments. Some uses include brake Adjusters and suspension alignment Adjusters. Adjusting Sleeve: An internally threaded sleeve located between the Tie-Rod Ends. The sleeve is rotated to adjust toe. Anchor: A brake part used to keep stationary brake parts from turning during braking. Anchor Pin: A pin or stud in a Drum Brake connected to the Brake Shoe ends. Anchor Plate: A Bracket or structure used to retain Disc Brake Caliper. Anti-Friction Bearing: A Bearing containing rollers or balls plus an inner and outer Race. Antilock Braking System: A braking system that monitors wheel speed and regulates brake Pressure to prevent the wheels from locking up. Asbestos: A nonflammable, heat-resistant mineral used to make Brake Linings. Airborne Asbestos dust is a health hazard. Asymmetric: Unequal surfaces or sizes. Atmospheric Pressure: The Pressure exerted by weight of earth's atmosphere, 14.7 psi at sea level. Automatic Adjuster: A brake device used to automatically adjust Brake Shoes as linings wear. Automatic Overdrive Transmission: An automatic Transmission with gears that cause its Output Shaft to spin faster than the engine when in high gear. Axial: Parallel to the axis of rotation. Axial Play: Movement that is parallel to the axis or rotation. Axle: A shaft that supports the wheels and can be driven by the engine. Backing Plate: A pressed steel plate where Drum Brake parts are mounted. Bail: A spring wire loop used to retain the cover of a Master Cylinder. Barrel Shape: A Brake Drum defect caused by excessive wear at the center of the Friction surface. Bearing: A device used to support a rotating part. Bearing Clearance: The amount of space left between a shaft and the Bearing surface for lubricating oil. Bearing Cone: The inner Race of a Roller Bearing. Bearing Cup: The outer Race of a Roller Bearing. Bearing Race: The outer or inner ring in which Bearing balls or rollers move. Bell Crank: A moving arm that is used to change the direction of motion. Bell Mouth: A Brake Drum defect caused by excessive wear or expansion at the open end of a Brake Drum. Bellows: A moveable rubber cover or seal that has folds like an accordion to allow for expansion and contraction of the associated parts. Bench Bleeding: A method for purging air from a brake component on a workbench before installing it on a vehicle. Bleeder Hose: A length of flexible hose or tubing that connects the bleeder Valve to a Bleeder Jar when Bleeding brakes. Bleeder Jar: A transparent container used during brake Bleeding, that collects escaping Brake Fluid and helps detect air in the Brake Fluid. Bleeder Screw: A device in the brake system component that can be opened to purge air from the brake system. Bleeder Wrench: A box wrench used to open and close brake Bleeder Screws. Bleeding: The procedure for purging air from a Hydraulic system. Boiling Point: The temperature at which liquid begins to turn to vapor. The Boiling Point of Brake Fluid is about 401 degrees. Bonded Lining: A Brake Lining attached to a metal Brake Shoe or Pad with adhesive. Boot: A flexible rubber or plastic cover used on brake components to keep out dirt, water, and contamination. Bore: The inside diameter of a Cylinder or hole. Boss: A heavy cast section that is used for support. Bracket: An attachment used to secure parts to the body, engine, or frame of a vehicle. Brake Disc Rotor: A Disc that is machined on both sides to allow brake Pads to clamp against the Disc to slow a vehicle. Brake Drum: A device that rotates around the fixed Brake Shoes and generates Friction to stop a vehicle when the Brake Shoes are applied to it. Brake Fade: The loss of brake Force caused by a buildup of heat in the brakes. Brake Feel: The physical feeling transmitted back to driver during braking. Brake Fluid: The liquid used to transmit application Force in Hydraulic brake systems. Brake Hose: A flexible rubber hose used to connect Hydraulic brake components. Brake Lathe: A machine tool used to machine Brake Drums and Rotors. Brake Line: A rigid, metal tubing that makes Hydraulic connection between brake components. Brake Lining: A Friction material attached to or bonded to metal Brake Shoes or Pad plates. Brake Shoe: The metal structure to which a Drum Brake Lining is attached. Brake Tubing: A double-wall welded steel tubing used to form Brake Lines. Brake Warning Light: A dashboard light that comes on to warn of brake system malfunction. Bump Steer: Erratic steering caused from rolling over bumps, cornering, or heavy braking. Bypass Port: A small hole connecting the Master Cylinder Reservoir with the Cylinder Bore. Allows fluid to bypass the primary seal and prevent a Vacuum from forming in the Pressure chamber with a quick release of brakes. Cage: A metal frame that positions balls or rollers and maintains their alignment in a Roller Bearing, ball Bearing, or ball type CV joint. Caliper: The actuating device for a Disc Brake that clamps brake Pads against the brake Rotor to generate Friction during braking. Cam Adjuster: An eccentric bolt used to change the position of parts like Drum Brake Shoes. Camber: The inward or outward tilt of the wheel at the top. Castellated Nut: A lock nut that has slots and is prevented from turning by installing a cotter pin through these slots and through a hole in the shaft it is mated to. Caster: The forward or rearward tilt of the steering axis at the top. Center Link: A steering Linkage component connected between the Pitman and Idler Arm. Coefficient of Friction: A measurement of the amount of resistance to movement between two objects in contact. Coil Springs: Spring steel spirals commonly used as springs in a vehicle Suspension System. Combination Valve: A Valve in a Hydraulic brake system combining more than one control or warning function. It generally consists of two or more of the following: Differential Pressure Switch, Metering Valve, and Proportioning Valve. Compensating Port: A small hole connecting the Master Cylinder Reservoir with the pressure chamber in the Bore. This is open when brakes are released to allow fluid to return to the Reservoir and compensates for fluid expansion and contraction with temperature changes. Conduction: The transmission of Energy between two bodies in contact. Constant Velocity (CV) Joint: A joint used in the Drive Shaft of front wheel drive vehicle's. Control Arm: A hinge link between a vehicle frame and the wheels allowing the wheels to move up and down independent of the frame. Control Valve: A Valve used to control Hydraulic Pressure or flow in a brake system. In an Antilock Braking System, Solenoid-operated Control Valves are used to control the ABS function. Convection: The transference of heat to moving air currents. Curb Weight: The weight of a vehicle with a full supply of fuel, oil, and coolant but with no driver, passengers, or luggage. Cylinder: A hole or Bore with parallel sides and a circular cross section. Cylinder Hone: A rotating tool with fine abrasive stones used to polish the Bore of a Cylinder. Diagonal Split System: A dual Hydraulic brake system where the right-front and left-rear brakes are connected to one Hydraulic circuit and the left-front and right-rear brakes to the other. Dial Indicator: A dial face precision measuring device used to measure movement. Diaphragm: A flexible membrane, generally rubber, separating two chambers but allowing the volumes of the chambers to change. Differential: A gear assembly that transmits power from the Drive Shaft to the drive Axles and allows the two drive Axles and drive wheels to turn at different speeds during cornering. Differential Carrier: The steel spider gear housing to which the Differential Ring Gear is attached. Differential Pressure Switch: The switch that turns on the Brake Warning Light when a partial Hydraulic failure occurs in the brakes system. Directional Stability: The ability of a car to travel in a straight line with a minimum of driver control. Disc Brake: A brake that uses a Rotor and a Caliper to convert Hydraulic Pressure into Force to generate Friction. Dog Tracking: The off Tracking of rear wheels to the left or right of the front wheels. Double Flare: A type of Flared end used on brake tubing. Dowel: A metal pin attached to one object which, when inserted into a hole in another object, ensures proper alignment. Drag Link: The tube connecting the steering gear's Pitman Arm to the steering knuckle. Driveline: The link between the Transmission output and drive Axle input. Drive Shaft: A metal tube with U-Joints or CV joints at each end; used to transmit power from the Transmission to the Axle and wheels. Drivetrain: All power transmitting components from the rear of the engine to the wheels. Drum Brake: A brake that uses a Drum with curved Brake Shoes forced against it to generate Friction. Dual Master Cylinder: A Master Cylinder with two separate Pressure chambers for use in a dual brake system. Duo-Servo: A Self-Energizing Drum Brake where both shoes are self-energized. Dust Cover: A cover used on brake components to keep out dirt, water, and other contaminants. Electronic Control Unit: A "computer" used to control vehicle functions, such as the ABS, fuel injection, air bags, etc. Electronic Control Module: An Electronic Control Unit. Energy-Absorbing Steering Column: A Steering Column that is designed to collapse in the event of a frontal collision to reduce injuries to the driver. Equalizer: A device in the Parking Brake system to equalize the pull on the Parking Brake cables of both rear wheels. Feeler Guage: A thin strip of metal of known thickness used to measure the clearance between parts. Fixed Caliper: A brake Caliper fixed to the mounting Bracket that contains Pistons on both sides of the brake Rotor. Fixed CV Joint: A CV joint that does not allow the shaft to move in or out. The Outer CV Joint on front-wheel drive cars is fixed. Flare: Expanded end of Brake Tubing. Flaring Tool: Tool used to make Flares on Brake Tubing. Floating Caliper: A brake Caliper that when applied moves laterally on slide pins to move the outer Pad into contact with the Rotor. Flushing: Replacing old fluid in Hydraulic brake system with new fluid. Foot-Pound: A unit of measurement for Torque. Force: Causes an object at rest to move or alters the motion of a moving object. Four-Wheel Drive: A vehicle that can apply power to drive all four wheels. Free Play: A loose Linkage, such as movement of the steering wheel before the tires start to turn. Friction: A resistance to movement. Friction Bearing: A Bearing with no moving parts such as an engine Bearing. Front to Rear Split System: A type of dual Hydraulic brake system where the two front brakes are connected to one Hydraulic circuit and the two rear brakes to the other. Halfshaft: The drive Axle going from a frame mounted Differential or a Transaxle to the drive wheels. Hard Spots: Spots in brake Rotor or Drum surfaces caused by excessive heat and Pressure that alters the metallurgical structure. Heat Dissipation: A process for brake parts convecting, conducting, and radiating heat generated by braking. High-Strength Steel (HSS): A low alloy steel that is much stronger than hot-rolled or cold-rolled sheet steels that normally are used in Unibody construction and some frames. Hold-Down: A device for holding Drum Brake Shoes against the brake Backing Plate. Hold-Down Spring: A spring used as a Drum Brake Shoe Hold-Down. Hub: The enclosure for Wheel Bearings. Hub Lock: A device used to engage or disengage four wheel drive Axles. Hub Nut: The large hex nut on the outer end of the Axle. Hydraulics: The use of liquids to transmit Force and motion. Hygroscopic: The tendency of Brake Fluid to absorb water. I-Beam Axle: An Axle with a cross section that resembles the letter "I". Idler Arm: A steering Linkage component opposite the Pitman Arm that supports the end of the Center Link. Imbalance: When more weight is on one side of a rotating component causing it to vibrate. Inboard: Toward the inside of the vehicle. Inboard CV Joint: The CV joint closest to the Transaxle or the Differential. Included Angle: The sum of the angles of Camber and Steering Axis Inclination. Independent Front Suspension: A front Suspension System in which each front wheel moves independently of the other. Independent Rear Suspension: A rear Suspension System in which each rear wheel moves independently of the other. Inertia: Tendency of a body at rest to remain at rest or a moving body to continue to move in the same direction. Integral: Parts combined to make a single unit. ISO Flare: A Brake Tubing Flare. Jack Standards: Supports placed under a vehicle that has been raised by a jack. Kinetic Energy: The Energy of a body in motion. Kingpin: A shaft on which the steering knuckle rotates. Lateral Runout: The side-to-side movement of a rotating wheel and tire assembly. Lead: The tendency of a car to deviate from a straight path on a level road when there is no pressure on the steering wheel in either direction. Leading Shoe: The front shoe in a Leading-Trailing Drum Brake. Leading-Trailing Drum Brake: A Drum Brake with a fixed Anchor at one end. Leaf Springs: Springs made of strips of steel. Limited-Slip Differential: A Differential that uses clutches to deliver power to both drive wheels when one wheel is slipping. Linkage: A system of rods and levers used to transmit motion or Force. Lip Seal: A type of rubber seal with a lip that is held against the sealing surface by internal Pressure. Live Axle: A driven Axle. Load Range: An alphabetic system used to identify the load limitations of a tire. Low Pedal: Excessive brake pedal travel. MacPherson Strut: An independent suspension mechanism consisting of a coil spring, shock absorber, and upper Bearing. Manual Brakes: A brake system that does not use a Power-Assist Unit. Master Cylinder: A component in a brake system that converts the Force of the driver pushing on the brake pedal into Hydraulic Pressure. Metering Valve: The Control Valve in a Hydraulic system to equalize initial braking between front Disc and rear Drum Brakes. Negative: The terminal of a battery from which electrons flow. Newton-Meter: The metric unit of Torque. NIASE: The National Institute of Automotive Service Excellence. On-Vehicle Service: The Service Operations performed on a component while it is installed on the vehicle. Organic Lining: A Brake Lining material compounded from organic materials, including Asbestos. O-Ring: A ring-shaped seal, generally rubber, with a circular cross section. Outboard: Toward the outside of a vehicle. Outboard CV Joint: The CV joint closest to the wheel. Outer Bearing Race: The outer part of a Bearing assembly on which the balls or rollers rotate. Outer Panels: Sheet metal sections that, when attached to the inner panels, form a vehicle's exterior. Out-of-Round: A wheel, tire or Brake Drum defect in which the wheel, tire or Brake Drum is not round. Output Driver: A transistor in the output control area of the processor that is used to turn various actuators on and off. Output Shaft: The main shaft of the Transmission where it attaches to the Drive Shaft. Overall Ratio: The product of the Transmission gear ratio multiplied by the final drive or rear Axle ratio. Overdrive: A Transmission that has gears that cause its Output Shaft to spin faster than the engine when in high gear. Overhaul: To completely disassemble an assembly such as an engine, to clean and inspect it, to reassemble it with new wear parts, and to make all adjustments necessary for proper operation. Overrunning Clutch: A device that only allows rotation in one direction. Oxidizing: The combination of a material with oxygen. Heat is usually released in the process. Parallelogram Steering: A steering system with an Idler Arm mounted parallel to the Pitman Arm. Parking Brake: A mechanically applied brake used to keep parked vehicle from moving. Parking Pawl: An arm on a lever that can be moved to lock the Output Shaft to the Transmission case so the car does not move when in park. Particulate: The small bits of solid matter found in exhaust gases. Partitions: The separations between the cells of a battery. Partitions are made of the same material as that of the outside case of the battery. Pawl: A lever that holds a mechanism stationary. Pedal Play: The distance the clutch pedal moves from the fully engaged position (foot off clutch pedal) to the point where the clutch begins to release. Pedal Reserve: The distance of the brake pedal from the floor when the brakes are fully applied. Perimeter Frame: A frame designed to surround the passenger compartment. Performance: Effectively operating at the maximum designed operating conditions. Petcock: A small Valve used for draining fluid. Petroleum: A group of liquid and gaseous compounds composed of carbon and hydrogen that are removed from the earth. Pillar: An upright body structure that supports the vehicle's roof. Ping: A sharp sound, like metal hitting a metal object. Pinion Gear: The smaller of two meshing gears. Piston: A movable part, fitted in a Cylinder, which can receive or transmit motion as a result of Pressure changes in the Cylinder. Piston Collapse: A condition describing a collapse or a reduction in diameter of the Piston Skirt due to heat or stress. Piston Cup: Cup-shaped seal used on a Hydraulic Piston. Piston Displacement: The volume of air displaced by moving a Piston from one end of its Bore to the other. Piston Head: That part of the Piston above the rings. Piston Lands: Those parts of a Piston between the Piston Rings. Piston Pin: The pin at the small end of an engine connecting rod. Piston Ring: The rings of an engine's Piston that seal the Piston to the Cylinder to prevent the transfer of fluid and gases between the combustion chamber and the crankcase. Piston Ring Gap: The clearance between the ends of the Piston Ring. Piston Ring Groove: The slots in an engine's Piston for the Piston Rings. Piston Seal: Seal used on a Hydraulic Piston. Piston Skirt: That part of an engine's Piston below the rings. Piston Skirt Expander: A spring or other device inserted in an engine's Piston Skirt to compensate for Piston Skirt collapse. Pit: A small depression in the surface of metal. Pitch: The number of threads per inch on any threaded part. Pitman Arm: A steering Linkage component that connects the steering gear to the steering Linkage. Planetary Gear System: A gear set commonly used in automatic Transmissions which has a central Sun Gear surrounded by two or more pinions or planet gears that are also mated to a Ring Gear. Play: Movement between mated parts. Plenum: The space in the engine's manifold below the throttle blade. Plies: The layers that make up the body of a tire. Ply Rating: A method of indicating relative tire strength. The Ply Rating usually does not include the actual number of Plies. Polarity: The two poles of electrification: Positive and Negative. Port: The openings in an engine for air intake and the combustion gas exhaust. Ported Vacuum: The engine Vacuum created above the throttle blade that increases when the throttle is opened. Porting: The enlarging, matching, and polishing of the engine's Ports to increase the flow of intake air and exhaust gases. Porting is generally done to performance and racing engines. Positive: The terminal of a battery to which electrons flow. Positive Crankcase Ventilation System: An emission control system that draws engine crankcase fumes into the air intake so they can be drawn into the engine's Cylinders and burned. Power-Assist Unit: A brake component that uses Vacuum or Hydraulic power to multiply brake pedal Force applied to the Master Cylinder. Power Brake: A brake system using a Power-Assist Unit. Power Head: A Power-Assist Unit. Power Steering: A steering system that uses Hydraulic Pressure to reduce the driver's turning effort. Power Take Off (PTO): A device used to hydraulically or mechanically drive vehicle mounted machinery such as tow truck winches and dump truck Hydraulics. Powertrain: The components that carry power from the engine to the drive wheels. Preignition: The ignition of the engine's intake charge before the Spark Plugs fires. Preload: The amount of load placed on a tapered Roller Bearing by its adjusting nut. Proper Preloading ensures minimum endplay with enough looseness to allow lubricant into the Bearing. Premature Failure: The failure of a part before the end of its expected Service life. Press Fit: A fit between two parts where the outer part is slightly larger than the inner part requiring them to be pressed together. Pressure: Force in terms of pounds per square inch. Pressure Control Valve: Proportioning Valve. Pressure Plate Assembly: A part of the clutch assembly with a plate to put pressure on the clutch disc, locking it to the engine's flywheel, allowing power to be transferred to the clutch disc and the Transmission. Preventive Maintenance: A Service procedures done to detect defects and malfunctions before they fail. Primary: The smaller barrels in a four barrel carburetor. Primary: The low Voltage circuit in the ignition system that powers a transformer (ignition coil) to induce current into the high Voltage side of the ignition. Primary Damage: The collision damage that occurs from direct contact with an impacted object or other vehicle. Primary Position: The Piston in a Dual Master Cylinder closest to the brake pedal. Primary Shoe: The leading Brake Shoe. Principal End: The end of the engine from where the power is taken. Usually the rear of the engine opposite the accessory drive belts. Proportioning Valve: A Hydraulic Control Valve used to prevent premature rear Wheel Lockup during heavy braking. Pull: The tendency of a vehicle to veer to one side due to unequal front Wheel Alignment or brake Imbalance. Pulse Generators: A device that generates a pulsing Voltage Signal commonly used to trigger the ignition and measure the speed of a vehicle's wheels or engine. Pushrod: A connecting link in an operating mechanism, such as the rod between the Valve Lifter and Rocker Arm on an engine. Quarter Glass: The window glass located in the upper Quarter Panel. Quarter Panel: The rear side panels of the vehicle. Quench Area: A surface in the combustion chamber designed to cool the temperature of the gases to help control the combustion process. Also called the squish area. Quenching: A process of rapid cooling of hot metal. Quick-Take-Up Master Cylinder: Master Cylinder designed to supply a large volume of low-pressure fluid with an initial brake application. Quick-Take-Up Valve: A flow and Pressure Control Valve used in a Quick-Take-Up Master Cylinder. Race: The inner and outer surface in which the balls or rollers of a Bearing operate. Rack-and-Pinion Steering: A steering gear with a Pinion Gear at the end of the steering shaft that meshes with a rack gear that is connected to the steering Linkage. Radiation: The process by which Energy is transmitted through space. Radiator: The component in a cooling system that transfers heat from the coolant to the outside air. Ream: To finish a hole with a rotating fluted tool. Rear Clip: A group of body parts that includes two Quarter Panels, upper and lower body panels, deck lid, bumper, floor pan, and may also include the rear half of the frame. Rear Wheelhouse Panel: An inner panel above the rear wheel. Rebound: An expansion of a suspension spring after it has been compressed as the result of jounce. Receiver-Drier: The component in some A/C systems that contains the desiccant and provides a place to store liquid refrigerant and filter moisture. Re-Core: A Repair to the Radiator by replacing the core but using the original tanks. Reference Voltage: A logic or communication method where constant level Voltage (usually 5V) is provided to potentiometers and Sensors which modify the Voltage and return it to the ECM (computer). The Voltage returned to the ECM tells it what the potentiometers and Sensors are "doing" or "seeing". Relative Motion: The motion between two parts. Relay: An electric or pneumatic switching device operated by a control circuit that controls the opening and closing of another circuit of higher volume or current capacity. Remove and Reinstall (R and R): A Service procedure that includes removal, and reinstallation of parts for inspection, lubrication, replacement and adjustment. Replace: To remove a used part or assembly and install a new part or assembly in its place. Repair: To restore a part or assembly to good operating condition. Reservoir: A Master Cylinder chamber for storing Brake Fluid. Residual Pressure (Check) Valve: Used to maintain slight fluid Pressure in a Hydraulic system when the brakes are released to keep the cup seals from leaking. Retaining Ring: A split ring that is held in a groove by its own tension. Retard: To adjust ignition time so the Spark Plugs fire later in the engines cycle. The opposite of Spark Advance. Return Spring: Spring used to return parts such as Brake Shoes to their original position after being moved. Ring Gear: A gear without a center. A Ring Gear is commonly used in a rear drive Axle with a drive pinion. Rocker Arm: A lever with one end on the engine's Valve Stem and the other end on the Pushrod. Rocker Panel: An outer body panel below the car door. Rockwell Hardness: A Scale for designating the hardness of a substance. Roller Bearing: An Anti-Friction Bearing using steel rollers. Roller Clutch: A type of one-way clutch that uses rollers. Roof Panel: Sheet metal that forms the top of the passenger compartment. Roof Rails: Framework that reinforces the sides of the Roof Panel. Rotor: A Disc Brake component that rotates with the wheel and provides Friction surfaces for the Brake Linings. RTV: Room Temperature Vulcanization. A liquid silicone rubber that hardens at room temperature and is commonly used to make or seal gaskets. Running-Fit: Where sufficient clearance has been allowed between the shaft and journal to allow free running without overheating. Runout: The amount a rotating part moves off a single plane. Scored: A scratch or groove in a Cylinder wall, brake Rotor, or Brake Drum caused by metal to metal contact or contact with abrasive particles. Sag: A type of frame damage in which one or both side rails bend and Sag at the cowl, causing buckles. Scale: A flaky deposit on steel or iron. Schrader Valve: A spring-closed Valve used in tire Valve Stems and A/C service ports. Score: Scratches or grooves in a surface resulting from metal rubbing against metal. Scuffing: A transfer of material between parts moving against each other as they wear. Seat: A machined surface upon which another part rests such as an engine Valve Seat. Secondary: The high Voltage circuit in the ignition system is powered by induced current from the Primary side of the ignition through a transformer (ignition coil) and is used to fire the Spark Plugs. Secondary Cup: A rubber cup seal located inside the Master Cylinder that keeps Brake Fluid from leaking onto the vehicle. 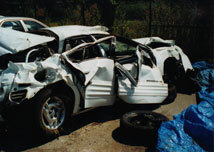 Secondary Damage: Collision damage that occurs due to displacement of body parts and Inertia. Secondary Piston: A Piston in the Dual Master Cylinder farthest from the brake pedal. Seconadry Shoe: The trailing Brake Shoe. Section Repair: A Repair made by cutting a component, removing the damaged portion, and replacing it with an undamaged component. Seize: A failure due to lack of lubrication or overexpansion where metal to metal contact prevents movement. Self-Adjusting Brake: A brake that automatically maintains proper Drum to lining clearance. Self-Adjusting Clutch Linkage: A clutch cable with a mechanism that automatically adjusts the clutch Pedal Play. Self-Energizing Brake: A Drum Brake designed so that Drum rotation increases the Force applied to the Brake Shoes. Semi-Metallic Lining: A type of Brake Lining using metallic components to improve high-temperature Performance. Sensor: A device that measures an operating condition and returns a Voltage Signal to an ECM (computer). Service: To make adjustments, Repairs, or Replace parts. Servicable: Parts or systems that can be repaired and maintained. Service Operations: Adjustments, Repairs, or Replacement of parts done for Preventive Maintenance, or to make the system operate after failure. Servo Action: A Drum Brake designed so that Drum rotation increases the Force applied to the Brake Shoes. Shift Forks: Semicircular castings fastened to the Shift Rails in a manual Transmission use to shift gears. Shift Lever: The part of the Transmission Shift Linkage moved by the driver. Shift Rails: The rods in a manual Transmission that the Shift Forks move on. Shift Valve: In an automatic Transmission, a Valve that moves to produce the Shifts from one gear ratio to another. Shim: A slotted strip of metal used as a spacer to adjust the front-end alignment or to make adjustments to the position of body panels and other parts. Shoe Pads: The raised Pads on a Drum Brake Backing Plate where the edges of the Brake Shoes slide as they are applied and released. Short and Long Arm Suspension (SLA): A Suspension System using an upper and lower Control Arm. The upper arm is shorter than the lower. This is done to allow the wheel to deflect in a vertical direction with a minimum change in Camber. Short Circuit: An electrical circuit in which the current bypasses some or all of the components in the circuit. Short to Ground: An electrical circuit in which current bypasses some or all of the components in the circuit and flows to ground hopefully causing the circuit's fuse to blow to prevent damage to the wiring. Shrink Fit: When the outer part of two mating parts is heated so the slightly larger outer part can be inserted into the smaller mating part. Commonly used to mate the engines connecting rods to their Piston Pins. Side Clearance: The clearance between the sides of moving parts when the sides do not serve as load-carrying surfaces. Side Gears: The gears that are meshed with the Differential pinions and are Splined to the Axle shafts. Side Member: A structural component of a Unibody vehicle. Side Sway: The collision damage that results when either the front, or rear of the vehicle has been pushed sideways. Signal: The Voltage used for communication in an electronic system. Single Brake System: A system with one Hydraulic circuit serving the brakes at all wheels. Single Master Cylinder: A Master Cylinder with only one Pressure chamber for use in Single Brake System. Slave Cylinder: A Cylinder that receives pressurized fluid from a Master Cylinder and converts it back into a mechanical Force. Used to engage and disengage brakes and clutches. Sliding Caliper: A brake Caliper that when applied moves laterally on slide pins to move the outer Pad into contact with the Rotor. Slip-In Bearing: A liner made of extremely accurate measurements that can be used for replacement purposes without additional fitting. Slip Joint: A variable-length connection that permits the Drive Shaft to change length. Sludge: A pasty substance that clogs oil passages and interferes with engine lubrication caused by the oxidation of motor oil and the mixing of oil with water. Snap Ring: A metal fastener, available in two types: The external Snap Ring fits into a groove in a shaft; the internal Snap Ring fits into a groove in a housing. Snap Rings often must be installed and removed with special snap-ring pliers. Soft Pedal: Abnormal brake pedal feel. Solder: An alloy of Lead and tin commonly used to bond electrical and electronic parts. Soldering: The bonding of electrical and electronic parts. Solenoid: A wire coil that a current is applied to create an electromagnet which causes its movable core to change position. Solid Rotor: A solid metal Disc Brake Rotor. Spark: An electrical current possessing sufficient pressure to jump through the air from one conductor to another. Spark Advance: The adjustment of ignition timing so the Spark Plugs fire earlier in the engine's cycle. Spark Gap: The space between the electrodes of a Spark Plug. Spark Plug: A device inserted into the combustion chamber of an engine that produces a Spark to ignite fuel. Spindle: A shaft on which the wheels of a vehicle rotate. Splash Shield: A sheet metal deflector used to protect a brake from road splash. Splines: Slots or grooves cut in a shaft or Bore. Spongy Pedal: Abnormal brake pedal feel. Spool Valve: A Hydraulic Valve consisting of a Bore and a rod with a varying diameter. When the rod is moved inside the Bore the variations in the diameter of the rod will allow or stop the flow of fluid through corresponding passages in the Bore. Commonly used to control an automatic Transmission. Sprag Clutch: A one-way Overrunning Clutch using a sprag to jam the inner and outer Races. Sprung Weight: The weight supported by the vehicle springs. Spur Gear: A gear with teeth cut horizontally across the outermost edge and therefore, looks like a boot spur. Square-Cut Seal: Similar to an O-Ring but with a square cross section. Stabilizer Bar: The Stabilizer Bar connects the two sides of a suspension so that cornering Forces on one wheel are shared by the other. Stabilizer Link: Connects one end of the Stabilizer Bar to the lower Control Arm. Starter Drive: The starter motor's drive Pinion Gear and Overrunning Clutch. Star Wheel Adjuster: Threaded device used to adjust Drum Brake Shoes. Static Friction: The Friction between two objects when they are stationary with respect to each other. Stator Shaft: A fixed shaft at the front of an automatic Transmission which the Torque Converter's stator spins around or locks against. Steering Arm: The arm of the steering knuckle to which the steering Linkage is attached. Steering Axis Inclination (SAI): The inward tilt of the steering knuckle's axis of rotation. Steering Column: The support for the driver's steering wheel. Steering Column Shift: A Transmission Shift Lever that is mounted on the Steering Column. Steering Stabilizer: A shock absorber attached to the steering linkage. Step Bore: A Cylinder that has Bores of two different diameters. Stroke: The distance moved by an engine's Piston. Stoichiometric: An air/fuel ratio that is not too rich or too lean or 14.7 parts air to 1 part fuel for gasoline. Stroking: Modifying an engine by increasing the engine's Stroke generally done to Performance and racing engines. Strut: A brace used between a Control Arm and the frame. Strut Assembly: Refers to all components of a Strut including the Strut tube, shock absorber, coil spring, and upper Bearing assembly. Strut Cartridge: A replaceable shock absorber unit that fits into the Strut tube. Strut Rod: A rod located ahead of or behind a lower Control Arm to retain the arm in its intended position. Sub-Frame: A mini-frame structure that supports the vehicle's front suspension. Sun Gear: The center gear of a Planetary Gear Set. Surge: Increasing and decreasing engine speed while the throttle is held in one position. Suspension System: The springs and other parts that support the upper part of a vehicle on its Axles and wheels. Sway Bar: The Sway Bar connects the two sides of a suspension so that cornering Forces on one wheel are shared by the other. Sway Bar Link: Connects one end of the Stabilizer Bar to the lower Control Arm. Synchronized: In a manual Transmission, the Synchronizer Assembly operates to improve the Shift quality in all forward gears. Synchronizer Assembly: A clutch that brings two rotating parts to the same speed. Commonly used in Synchronized manual Transmissions between two gears to keep them from grinding while shifting. When shifting a manual shift vehicle the resistance felt in a shift gate just before the gear is engaged is the synchronizer pressing against the gear to speed it up. This resistance is particularly noticeable during downshifting. Tach: A Tachometer which is a gauge used to measure engine speed in revolutions per minute (RPM). Tachometer: A gauge used to measure engine speed in revolutions per minute (RPM). Tap: A tool used to cut threads in a hole. Tappet: The adjusting screw for varying the clearance between the Valve Stem and the cam. TBI: Throttle Body Fuel Injection. TDC: Top Dead Center when an engine's Piston is at the top of its Stroke. Tell-Tale Light: A dash warning light. Thermal Shock: A sudden change in temperature that can cause parts to crack or Seize. Thermostat: A device used to control the coolant circulation in the engine's cooling system, which regulates engine temperature. Throttle Position Sensor: A variable resistor usually connected to the throttle body that modifies the Signal Voltage between 0 and 5 Volts DC proportional to the position of the throttle where a Voltage near 0 tells the ECM that the throttle is closed and 5 Volts tells the ECM that the throttle is wide open. Throttle Valve: A round disk Valve in the fuel injection's throttle body or the carburetor that is opened by the accelerator pedal to control engine/vehicle speed. Throw: The distance from the center of the engine's crankshaft main Bearing journal to the center of the connecting rod journal. Thrust Bearing: A Bearing used to prevent excessive end Play. Thrust Surface: A surface upon which a pushing load is applied. Tie-Rod Assembly: The tie rod ends and Adjusting Sleeve. Tie-Rod End: The ball stud and sockets at the end of the Tie-Rods. Tie-Rods: The rods that link the Steering Arms to other steering components. Tie-Rod Sleeves: The tubes with internal threads in which the Tie-Rod Ends are threaded and are used to change the length of the Tie-Rod. Timing Chain: The chain used to drive the engine's camshaft. Timing Gears: Gears used to drive the engine's camshaft. Tire Flat Spots: The tire wear patterns resulting from locked wheel skids. Tire Rotation: The moving of wheel and tire assemblies to different locations on the vehicle to equalize tire wear. Toe-in: When the steer tires are closer together in the front. Toe-out: When the steer tires are further apart in the front. Tolerance: The difference between the specified maximum and minimum levels. Torque: The Twisting Force on a shaft or to tighten a fastener to specified degree of tightness. Torque Converter: The fluid coupling between an engine and an automatic Transmission, which uses a stator to increase Torque. Torque Sequence: The order in which a series of threaded fasteners should be tightened. Torque Steer: A steering pull caused by acceleration common to a vehicle with Asymmetrical drive Axles. Torque Wrench: A wrench that indicates the amount of Torque being applied to a threaded part. Torsion Bar Spring: A long, straight bar fastened to the frame at one end and to a Control Arm at the other. Spring action is produced by the twisting of the bar. Tracking: The ability of the rear wheels to follow the front wheels. Tram Gauges: Gauges used to accurately measure and diagnose collision damage misalignment. Transaxle: A Powertrain unit that combines the Transmission, final drive gears, and Differential assembly in one housing. Transmission: A network of gears used to multiply or reduce engine Torque and provide park, neutral, and reverse. Transmission Fluid Cooler: A heat exchanger which transfers heat from the automatic Transmission fluid to the engine's coolant or to the surrounding air. Transfer Case: A gearbox mounted in back of the Transmission which can be used to put a vehicle in four-wheel drive and may have a high and a low speed range. Transfer Time: The time necessary to remove parts of an assembly from an old part to a new part. Tripod Joint: A type of CV joint that uses three Roller Bearings. Truck Tractor: Any motor vehicle designed primarily for pulling semi-trailers. Trunnions: The shafts that project from the tripod assembly of the Tripod Joint. Tube Nut: The nut used to connect and retain the Flared end of Brake Tubing. Tube Nut Wrench: A wrench used to tighten or loosen a tube. Tulip: The outer housing on a Tripod CV Joint. Turbine: A Torque Converter component. Turning Radius: The amount (in degrees) one front wheel turns more sharply than the other front wheel during a turn or Toe-Out in turns. Turbo Hydra-Matic: An automatic Transmission built by General Motors. Twin I-Beam Axle: An independent Suspension System on Ford trucks. Twist: A type of structural collision damage where the frame rails are bent out of alignment and are no longer horizontally parallel. U-Joint: A flexible coupling that transmits rotary motion from one shaft to another shaft at varying angles. Commonly used in Drive Shafts. Unibody: A vehicle whose body and frame are combined as one assembly. Unitized Construction: A vehicle whose body and frame are combined as one assembly. Universal Joint: A flexible coupling that transmits rotary motion from one shaft to another shaft at varying angles. Commonly used in Drive Shafts. Universal Measuring System: A collision damage measuring system. Unsprung Weight: The weight of vehicle parts that are not supported by the suspension. Upshift: To shift a Transmission in to a higher gear. Vacuum: A Pressure less than Atmospheric Pressure. Vacuum Advance: A device that changes ignition timing as the engine's speed change. Vacuum Check Valve: A one-way Valve used to retain the Vacuum Signal in a line after the Vacuum source is gone. Vacuum Gauge: An instrument designed to measure Vacuum. Vacuum Modulator: A device in automatic Transmissions that changes the Hydraulic Pressures that control shifting. Vacuum Reservoir: Stores Vacuum to prevent sudden drops in the Vacuum used by Vacuum controlled devices during acceleration. Valence Panel: An outer body panel placed over or below the front or rear bumpers to cover the underbody. Valve: Any device that can be opened or closed to allow or stop the flow of a liquid or gas. Valve Body: The Hydraulic control system of an automatic Transmission that contains the Spool Valves. Valve Clearance: The gap between the end of the engine's Valve Stems and the Valve Lifter or Rocker Arm. Valve Face: The part of an engine's Valve that mates the Valve Seat surface. Valve Grinding: A process of reconditioning an engine's Valves. Valve-In-Head Engine: An overhead Valve engine. Valve Key or Valve Lock: A device that holds the Valve Spring washer in place on the Valve Stem. Valve Lifter: A device that rides on the camshaft's lobe and opens the Valves on an engine through the Pushrod and Rocker Arm. Valve Seat: The machined surface upon which the Valve Face rests. Valve Spring: A spring attached to an engine's Valve to return it to its Seat. Valve Steam Guide: A bushing that the Valve Stem moves in. Vapor Lock: A condition where fuel boils in the fuel system stopping the flow of fuel. Vehicle Identification Number (VIN): A standardized 17-digit number assigned to every highway vehicle by its manufacturer for identification purposes. Vented or Ventilated Rotor: Disc Brake Rotor that has ventilating fins between the Friction surfaces to aid in cooling. Vibration Damper: A device to reduce the crankshaft's Twisting vibrations. Also known as a harmonic balancer. Viscosity: The resistance to flow or the thickness of a liquid. Viscosimeter: An instrument for determining the Viscosity of a liquid. Volatility: The tendency for a fluid to evaporate. Volt: A unit of measurement of electromotive Force. Voltage: The total electromotive Force applied to a given circuit. Wear Sensor: A device that can be heard, seen, or felt to warn the driver of excessive Brake Lining wear. Wheel Alignment: Positioning of the suspension and steering where by a vehicle handles properly and the tires wear properly. Wheelbase: The distance between the centerlines of the front and rear Axles. For trucks with tandem rear Axles, the rear center line is considered to be midway between the two rear Axles. Wheel Bearing: An Anti-Friction Bearing used to support the wheel and allow it to turn freely. Wheel Cylinder: A Cylinder that converts Hydraulic Pressure into Force to apply the Brake Shoes. Wheel Lockup: Where wheels are not rotating but skidding. Wheel Sensor: A device used to sense the speed of the wheels in an Antilock Brake System. Windshield Header: The reinforcement for the top of the windshield opening and front of the Roof Panel. Worm: A type of gear in which the teeth resemble threads. Commonly used in steering gear boxes. Wrist Pin: An engine's Piston Pin. Yoke: The part of a Universal Joint assembly attached to the Drive Shaft, Axle or Transmission. Zerk: A lubrication fitting for applying grease.